China's one-party political landscape on Sunday changed as the country's rubber-stamp parliament ratified a historic constitutional amendment abolishing the two-term limit for President Xi Jinping, paving the way for his continuation in power perhaps for life. Set for his second five-year term as President this month, 64-year-old Xi, the most powerful leader in recent decades heading the ruling Communist Party of China and the military, will now be the first Chinese leader after the founder chairman Mao Zedong to remain in power lifelong. The National People's Congress has kept its reputation as the rubber stamp parliament for its routine approval of CPC proposals by voting exactly to the official script. The amendment removing the term limits for the president and the vice president was approved by the NPC with 2,958 in favour, two against and three abstentions, official media reported. The two votes of dissent were apparently has the official sanction to show semblance of diversity. For Sunday's vote, the NPC chose to follow paper ballot system instead of hand raising and electronic voting. Xi stood up first at the Great Hall of the People in Beijing to cast his paper ballot in a red box. The first Constitution of China was enacted in 1954. The current Constitution has been in place since 1982 and has undergone four amendments in 1988, 1993, 1999 and 2004. The removal of the term limit was regarded as the biggest political change in the one-party system which remained in force in China since 1949. Ahead of the vote by deputies in the NPC, the seven member Standing Committee -- the topmost body of the ruling Communist Party of China -- unanimously approved the amendment to abolish the presidential term limits. Observers say the constitutional amendment in effective pays the way for China's transition from being one-party state to one leader state with Xi, described by some as an Emperor, to remain in power in the foreseeable future. Xi, christened as 'lingxiu' -- a leader with highest prestige, is aggressively pushing Chinese military's modernisation to make the world's largest army a mightier force capable of winning modern wars. The proposal of limitless tenure for Xi has sparked worldwide concerns specially in China's neighbourhood. For India, observers say, Xi's continuation will have particular significance, especially in the backdrop of last year's 73-day-long Doklam standoff where Chinese troops tried to build a road in the area claimed by Bhutan to reach close to India's narrow corridor connecting North Eastern states. Under Xi, China has been pouring billions of dollars in India's neighbourhood in projects like China-Pakistan Economic Corridor traversing through Pakistan-occupied Kashmir, connectivity projects in Nepal, Sri Lanka and Maldives, raising strategic stakes for India. Significantly, Sunday's amendment also removed term-limits for the Vice President. The inclusion of the Vice President was notably aimed at reinforcing Xi's support base as his trusted lieutenant, Wang Qishan (69), is tipped to take over the post despite a widely-followed convention by Chinese leaders to retire after 68 years. Wang headed the dreaded anti-graft campaign carried out by Xi since he began his first term in 2013. The NPC in the next few days is also set to ratify new name for all top government posts. The entire Chinese government is set to change, including the entire cabinet. In his interaction with the deputies of the NPC, Xi warned Chinese officials to shed ‘pillow talk’ and ensure that they and their families refrain from indulging in corruption. Xi said officials should strengthen self-control and not get tempted. "Don't let pillow talk lead you down to corruption. Don't let your children engage in self-dealing using your name. Don't be dragged into the 'muddy water' by people around you," Xi was quoted as saying by the state-run Xinhua news agency. "Officials should never indulge themselves, never cross the line, never break the rule, and improve immunity to corruption," he said. Xi underlined a ‘clean and upright’ political ecology and urged leading officials to uphold rule of law. Xi asked officials to uphold rule of law, oppose rule of man, hold in awe of the Constitution, and exercise their duty within the boundaries of the Constitution and laws, the report said. The officials should uphold the political virtue, public virtue, individual virtue by refraining from corruption. He warned that an official should keep both himself and the whole family ‘clean’. 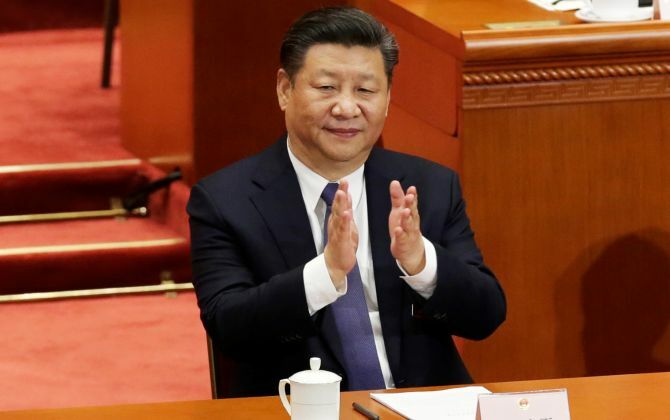 Xi began his second five-year term as General Secretary of the CPC and Chairman of the Central Military Commission last year after the once-in-a-five-year congress of the party endorsed him for a second term. Two five-year tenures were permitted for top leaders of the party. His predecessors - Jiang Zemin who was in power from 1993 to 2003 and Hu Jintao from 2003 to 2013 - stepped down as the General Secretary of the party as well as the president after widely followed rule as well as a convention of two terms to promote collective leadership system in the one-party state. Xi, a princeling and son of a Vice Premier, who was the Vice President under Hu took over all the three posts in 2013 and subsequently emerged as the most powerful leader of China after Mao with little or no resistance in the party. The president's post is largely ceremonial while the real power rests with the CPC General Secretary and Chairman of the Military Commission, the overall high-command of the military. But the president is the only one with a formal limit of two terms -- introduced by late paramount leader Deng Xiaoping in 1982 to prevent another lifelong dictatorship after Mao's rule. The NPC also endorsed another constitutional amendment to enshrine Xi Jinping Thought on Socialism with Chinese Characteristics for a New Era into the country's Constitution. This would make Xi the only leader after Mao and his predecessor Deng whose thoughts were written into the Constitution. It would place him above the rest of the leaders of the party. There is eerie silence all over the country over the approval of the amendments, with Chinese censors aggressively removing anything remotely connected to the comments in the social media through the firewalls. Is China's golden age coming to an end?